﻿ Introducing New Pop-Up Forms to Build Your Email List » Red Mango Marketing! That’s roughly how long the average visitor stays on your website before leaving you behind and taking their email address with them on the way out. Given this fleeting window to capture both the attention and contact information of prospects, we’re excited to announce upgrades to our website sign-up forms that will help you build an engaged audience before they jump to their next online destination. These improvements to our sign-up forms now make it considerably faster and easier than ever to grow your email list in an age of dwindling attention spans. In addition to now being simpler and quicker to create and implement these forms with our brand new form editor, we have also drastically improved our security measures to ensure you are protected from spambots. Maximize your email list size with a captivating form for your website that delivers greater sign-ups compared to static versions. According to research conducted by Sumo, the average opt-in rate on a pop-up is about 3 percent while the top performing 10 percent of pop-up forms convert at a whopping 9.3 percent. That means almost one in every 10 visitors to the website, joined the list! Set timed and exit intent triggersRemember that 15-second window we mentioned earlier? With timed triggers, pop-up forms can now be initiated to capitalize within that sweet spot, including the instant a visitor arrives on your site as well as one, three, five, 10, or 15 seconds into their visit. Leaving so soon? Using exit intent triggers, you’ll be able to provide one last chance to entice visitors to subscribe before they click out. Along with being potentially harmful, spam also cheapens the value of the subscriber list you’ve worked hard to cultivate. Now, all your forms are secured by Google’s Invisible reCAPTCHA tool, giving you peace of mind in knowing that all of your subscribers are real people while improving your email deliverability and open rates. Your brand is unique, which is why our redesigned editor helps ensure that the same personality you maintain throughout your website is reflected in your forms too. Seamlessly tailor pop-up forms that match your branding with a full suite of customization options and coloring, including an editable call-to-action button. There is even a live preview function that allows you to see how great your form looks in real time before you publish. Pop-up forms only require a one-time code install, making all future edits easily managed in your account without ever having to update or change the code on your website again. Plus, once installed, the code is good for life since we know you’ve got plenty else on your to-do list. All our forms are automatically hooked up to our welcome email feature, allowing you to engage with your new subscribers right when they opt in. If you really want to take things to the next level, try setting up an autoresponder series to reach new subscribers over a longer period of time. Online visitors won’t wait around, and neither should you, so log in and add the new pop-up forms to your website today! If you’re not a Constant Contact customer yet, you can also sign up for free. 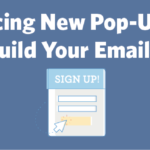 The post Introducing New Pop-Up Forms to Build Your Email List appeared first on Constant Contact Blogs. This entry was posted on Friday, November 17th, 2017 at 10:30 am	and is filed under Email Marketing, List Growth, News & Updates. You can follow any responses to this entry through the RSS 2.0 feed. Both comments and pings are currently closed.